You can easily migrate all email lists subscribers from your existing account of GetResponse to EasySendy Pro. In order to do this, you need to export all email from each email list of your GetResponse account and then import them inside your EasySendy Drip (or EasySendy Pro) account accordingly. Login to your existing GetResponse Account (users account) and Click on “Search Contacts“option under the “Contacts” tab present on the Dashboard. Now on the next screen, use the drop-down menus to choose the parameters of the list you want to export. Then click the “Show contacts” button at the bottom of the page to display the list. 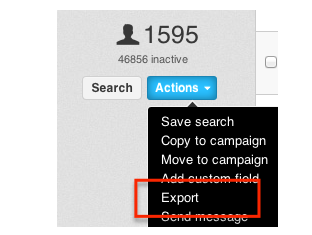 Select “Actions” button from the toolbar on the left and choose “Export” icon. Enter a file name, then choose a file type (csv, xls*, xml) using the drop-down menu and click the “Go” button to generate a file ready to download. Extract the downloaded file and edit the .csv file accordingly. Now, login to your EasySendy Drip (or EasySendy Pro) Account. Why do you need to add a SMTP delivery server? What is Sending Domain Name? Where to get Email Templates for Email Marketing? How to Upgrade EasySendy Drip (or EasySendy Pro) Subscription? How to Downgrade EasySendy Drip (or EasySendy Pro) Subscription? How to Make The Payment Through Bank Transfer -NEFT/Wire Transfer? How to Export your EasySendy Drip (or EasySendy Pro) Accounts Data? How to add Date of Birth in your Account? How to Delete Complete Data of a Subscriber? How to Cancel EasySendy Drip (or EasySendy Pro) account? Create Custom Field Tags for Email Subscribers? How to filter subscribers by their date added? How to Create Automatic Geo-Segmentation? How To Use Email Suppression/Blacklist List? How to Quickly Re-Subscribe Blacklisted Emails? How to create new list based on advanced Subscriber filters? How to Send Date Based Email Trigger Campaigns? How to Send Test Email Campaign / Template? How to use TWIG in email templates ? How to Securely Share Email Campaign Stats? How to add emoji for campaign subject lines? How to bulk export basic stats for campaigns? Where to get 24 hours performance graphs for campaigns? Where to get devices and countries pie chart for campaigns? Where to get domain wise email open report for campaigns? How to use Event based email campaigns? How to Send A/B Split Test Email Campaign? How to activate (Same Time Zone Delivery) Time-warp inside Email Campaigns? How to Create an Email Campaign only for a Single Subscriber? How Monitored Email Mailbox Work inside EasySendy Drip (or EasySendy Pro)? How to use re-engagement campaign? How To Use Email Pre-Header In Templates ? How to enable reCAPTCHA on Web Pop Forms? How to clear Cache and cookie of Web Pop Forms? How to Mask the Email Address of Subscribers? How to enable Email Verifier on your EasySendy Drip (or EasySendy Pro) account? How to create Bulk SMS Campaign? How To Buy Numbers For Sending SMS? How To Setup SMS Delivery Setting? How To Use SMS Dashboard? How To Use SMS Reports? How to upload / create new SMS List? How to use SMS Webforms? How to create SMS Campaigns? How to create New SMS Scheduler? What is Warmup process and how to do it? How to Export Email Campaigns Sent to a Particular Subscriber? How to Send Re-consent / Re-optin Email to your Subscribers? How to Search / Find Email Subscribers in Email List Database? How to remove "Email sent through EasySendy Pro" from emails? How to Validate and Activate Delivery Server? What is Pending-sending Status of Email Campaign? Why Do I Need To Give PowerUser Access To Amazon SES? How to remove "Powered by EasySendy Pro" logo from email templates?